Premiership club Chelsea's wild spending on transfer fees is over after making a record pre-tax loss for last year of £88m. The club spent £175m on new players last season, more than doubling its annual payroll to £115m. 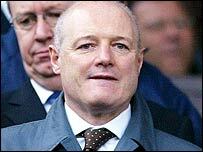 Chelsea chief executive Peter Kenyon said the club aimed to break even by the financial year of 2009-2010. He said: "Two years ago we were seen as streets paved with gold. That is over. Chelsea is now being run properly." The club is "being run as a business", he said. Manchester United's payroll at the same time was £77m. 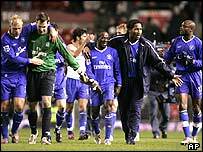 At the other end of the league, West Bromwich Albion's in 2003 was just £11.5m. Wages gobbled up 76% of Chelsea's total income last year, way beyond what is considered prudent. Mr Kenyon has vowed to bring down that figure to no more than 55%. For almost any other British club, a financial imbalance on this scale would be ruinous. Not so at Chelsea. 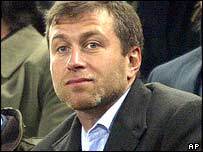 Owner, Roman Abramovich, the Russian billionaire, underpins the club's finances with a loan of £115m. Without his cash, Chelsea's auditors, KPMG, would not be able to sign off the business as a going concern. The club's accounts for 2003-04, which have been seen by the BBC, will be lodged with Companies House on Monday. 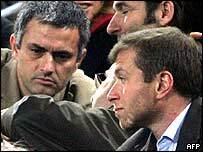 Not surprisingly, many Chelsea supporters are worried about what might happen to their team if Mr Abramovich were to lose interest. They remember only too well the previous record loss, announced by Leeds United in 2003, which led to the Yorkshire club nearly collapsing. But Mr Kenyon insists that Blues fans should relax: "Roman is at Chelsea for the long run. He has bought in completely to the vision of making this club one of the biggest and best in Europe. "This was not a vanity purchase for the owner. It's a serious investment with a long-term business plan." Mr Kenyon, who was hired from Manchester United one year ago, has been spectacularly well rewarded for his 12 months at Stamford Bridge. His total remuneration last year was £3.5m, which included a signing-on fee and compensation for loss of benefits at Old Trafford. Few executives outside those with elite FTSE-100 companies can expect to earn anything like this. Last year, the club increased revenues by 40% to £152m, reflecting an excellent run to the semi-final of the European Champions League and stronger merchandising. But Mr Kenyon said there is still a long way to go: "Our sponsorship income, match day receipts and TV revenues are all capable of significant growth." Having dumped Umbro as its kit supplier, Chelsea has signed an eight-year deal with Adidas, worth £100m. Several international companies are vying to strike a shirt sponsorship deal for the 2006-07 season. Chelsea has also targeted the United States and China as overseas markets where its brand could sell well. While trying to pump up income, Kenyon insists the club has also set itself "some aggressive targets" for reducing its payroll. "Our squad was too large and too expensive," he admitted. Outgoings on transfer fees this season are so far only half what they were in 2003-04. As part of this economy drive, Chelsea has invested heavily in a training and youth facility at Cobham, where the club hopes to develop - instead of having to buy - its stars of the future. Chelsea's Portuguese coach, Jose Mourinho, has told Mr Kenyon that he is happy with his 24-man squad and accepts that, from now on, if the club wants to make a big-money purchase, a player will have to be sold to help fund the deal. Chelsea's commercial budget is not based on winning a trophy, but it does assume a top-four finish in the Premiership, thereby guaranteeing a lucrative place in the Champions League. Such an assumption was also made by Leeds United, which turned out to be a near-fatal mistake when it failed to qualify. It then buckled under the weight of massive debts. A similar outcome is hardly likely at Chelsea. In just 18 months, Abramovich has poured a king's ransom into the west London club; it seems inconceivable that he would abandon it before having enjoyed lasting success on the pitch. The Russian is living the dream. Unlike the former regime at Leeds, he can well afford his reveries. Will Kenyon's business nous work for Chelsea?